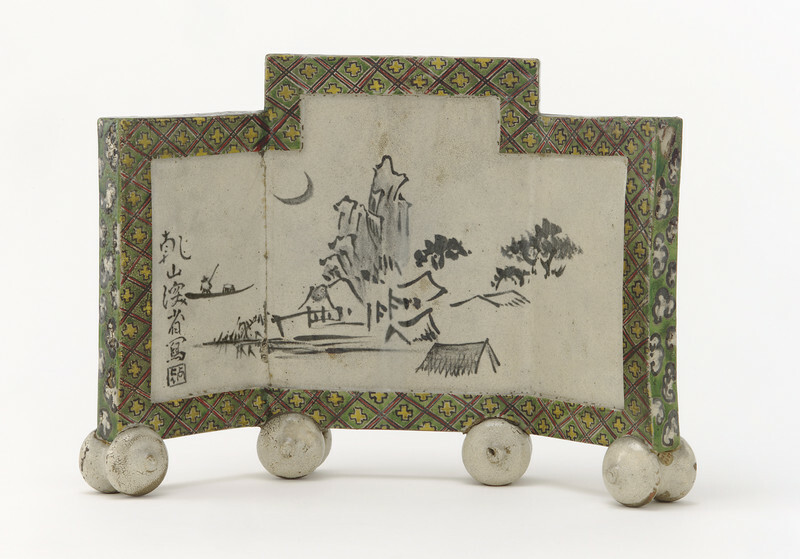 This desk screen is one of several ceramics that Freer acquired and believed to be by the renowned Kyoto ceramist Ogata Kenzan (1663-1743), but since have been reattributed to nineteenth-century imitators. In his 1885 book Japanese Homes and Their Surroundings, Edward Sylvester Morse commented on the format of works like this: "In the old-fashioned genkan, or hall-way, there stands a solid screen of wood with heavy frame, supported by two transverse feet. This screen is called tsui-tate, and is an article of furniture belonging to the hall....Diminutive models of the tsui-tate are made in pottery or porcelain, and these are for the purpose of standing in front of the ink-stone to prevent the mats from being spattered when the ink is rubbed." In the Peacock Room in Detroit, this desk screen was placed among ceramic vessels with similar landscape decorations. Buff clay; iron pigment, enamels under transparent lead glaze. Imitation of Ogata Kenzan, "Inkstone screen," in The Peacock Room, Freer Gallery of Art, Smithsonian Institution, Accession No. F1897.20, Item #3173, http://www.peacockroom.wayne.edu/items/show/3173 (accessed April 19, 2019).